Wahama senior Abram Pauley (12) releases a shot attempt over Hannan defender Dalton Coleman during the second half of Friday night’s boys basketball contest in Mason, W.Va.
Hannan junior Andrew Gillispie (2) drives to the basket while being defended by Wahama’s Skyler Estep (10) during the second half of Friday night’s boys basketball contest in Mason, W.Va.
MASON, W.Va. — The White Falcons tried to give it away, then changed their minds down the stretch. 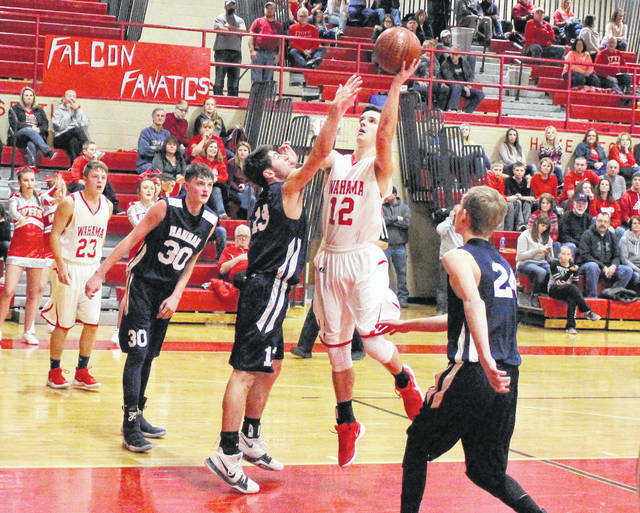 The Wahama boys basketball team held a pair of 16-point leads in the first half, but the hosts ultimately trailed in the third quarter and had to make a 27-17 surge over the final 10:23 of regulation to secure a hard-fought 66-58 victory over Hannan in a non-conference battle of Mason County programs at Gary Clark Court. The Wildcats (1-4) struggled out of the gates as the guests went 1-of-15 from the field in the opening nine-plus minutes, and the White Falcons (2-6) made the most of that opportunity while establishing a 14-5 cushion through one quarter of play. The Red and White followed with an 18-11 run that led to a 32-16 edge at the 1:09 mark, then both teams traded points for a 34-18 contest with 35 seconds left in the first half. The Blue and White, however, scored the final four points and entered halftime facing a 34-22 deficit. The Wildcats — who shot just 24 percent in the first half — came out of the locker room on fire as the guests went 7-of-15 from the field and hit four three-pointers, which led to a 19-2 surge that gave Hannan a brief 41-39 lead with 2:50 remaining in the quarter. 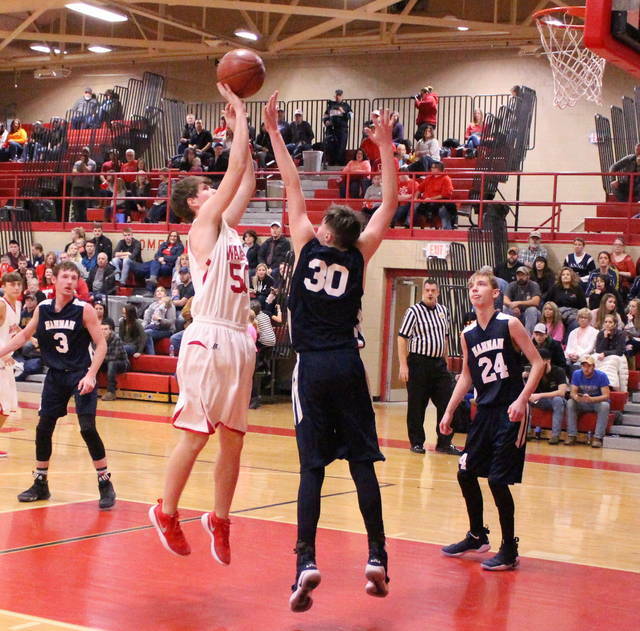 Wahama, however, answered with eight straight points as part of a 10-2 charge over the final 2:23 that allowed the hosts to take a 49-43 cushion into the finale. Hannan twice pulled back to within a possession in the opening 90 seconds of the fourth, but the White Falcons made an 11-2 surge that provided some breathing room with a 62-50 lead with 3:28 left to go. The Wildcats responded with five straight points to close back to within seven with 2:42 remaining, but the guests were ultimately never closer the rest of the way. The Red and White ended regulation with a small 4-3 spurt to wrap up the eight-point triumph. Wahama committed four of the five turnovers in the third quarter and had twice as many miscues (6-3) than Hannan in the second half. The hosts — despite owning a 12-point lead at halftime — also went 0-for-4 from behind the arc in the third period and 1-of-7 from three after the break. However, when the White Falcons needed to find some offense late in the third quarter — the Red and White found a way to get it done. As WHS coach Ron Bradley noted afterwards, it was a frustrating victory — but there were some real positives despite the fact that his troops could have let this one slip away. And, at the end of the night, you don’t have to apologize for wins — especially when playing your third game in as many days. “The biggest positive tonight was after Hannan made that big run to get back in it, we stepped it up and extended the lead again. That was huge for us because we’ve struggled with that this season, so it was definitely a sign of growth and a step in the right direction,” Bradley said. “You know, we didn’t manage the lead well and we had too many turnovers and took some poor shots with a lead. Hannan has a dangerous team and they got hot in the second half … and it almost came back to bite us. With the exception of the slow start, HHS coach Becky Ferrell was pleased with her squad’s overall effort — particularly after the break. Most importantly, the Wildcats continued to work through adversity — a sign of real growth. 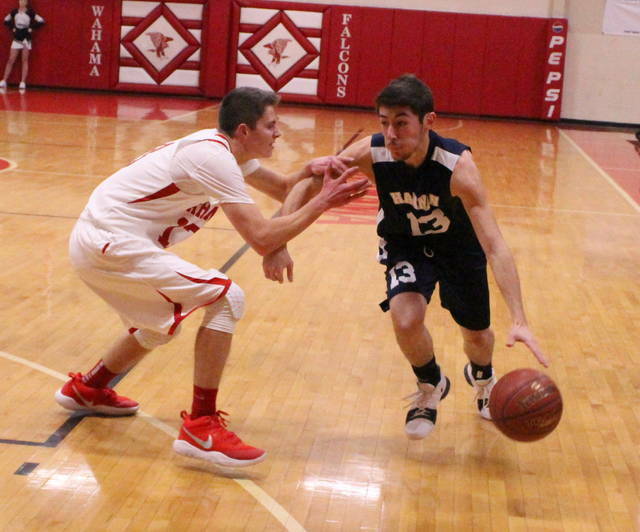 Wahama outrebounded the guests by a 50-30 overall margin, including an 18-9 edge on the offensive glass. The hosts also committed 11 of the 19 turnovers in the contest. The White Falcons made 26-of-62 field goal attempts for 42 percent, including a 3-of-17 effort from three-point range for 18 percent. The hosts were also 11-of-17 at the free throw line for 65 percent. Noah Litchfield led WHS with a double-double effort of 34 points and 12 rebounds, both of which were game-highs. Abram Pauley was next with a dozen points and Tyler Bumgarner added seven markers. Brady Bumgarner and Jacob Warth each contributed six points, while Dakota Belcher and Isaiah Pauley completed the winning tally with respective efforts of two points and one point. Belcher and Abram Pauley also hauled in nine and eight rebounds, respectively. The Wildcats netted 19-of-55 shot attempts for 35 percent, including a 9-of-24 effort from behind the arc for 38 percent. The guests were also 11-of-23 at the charity stripe for 48 percent. Malachi Cade paced HHS with 18 points and Dalton Coleman added 17 points, while Logan Nibert chipped in 10 markers. Matthew Qualls was next with eight points, while Andrew Gillispie and Devrick Burris completed the scoring with four points and one point. Burris, Cade and Justis Powers-Cupp all grabbed six rebounds apiece for the guests. 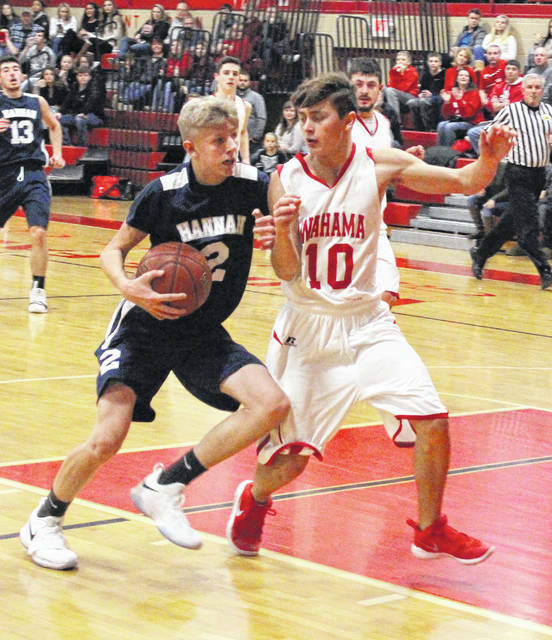 Wahama returns to action on Friday when it travels to Stewart for a TVC Hocking contest against Federal Hocking at 7:30 p.m.
Hannan travels to Buffalo on Wednesday as part of a boys-girls doubleheader, with the Wildcats slated to play at 7:30 p.m.